Tour a beautiful Newport RI Mansion for a "trip back in history". A "must see" on any Newport Rhode Island Vacation are the elegant homes on Bellevue Avenue owned by the 19th century merchant traders. The first time I visited Newport, I remember driving down the majestic Bellevue Avenue past the Newport Mansions and being awestruck. These beautiful Mansions are set on a lovely tree-lined street. Many of the homes overlook the ocean. Several other special tours during the Holidays. If you are looking for Newport Mansions Discounts, want to see all 11 properties, or will be traveling more than once to Newport, consider becoming a member of the Preservation Society . This allows unlimited visits to all 11 properties for the year plus other benefits. The cost is just about $20 more than the 5 home tour, so it's quite a deal. 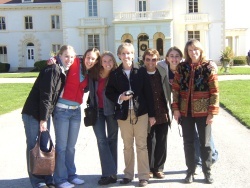 Newport was one of our "Girls Getaways" (below - 3 generations!) and we really enjoyed the tour of this mansion on our Newport Rhode Island Vacation. There were actors portraying Mrs. Astor, her family and domestic staff interacting with visitors as we walked through Beechwood Mansion. After the tour, everyone gathered in the salon for some music and dancing. 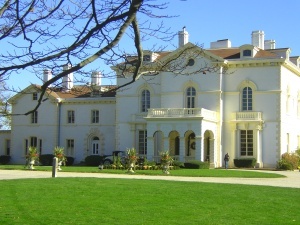 Unfortunately Astor's Beechwood was sold to a private party in 2010 and the public tours are no longer available. Be sure to include nearby Cliff Walk and Ocean Drive in your list on things to do in Newport. Even if you don't actually tour a Newport RI Mansion, strolling down Bellevue Avenue will make for a very memorable experience on your Newport Weekend Getaway.